I may not look it when I'm out in public, but in the privacy of my own home (er, the apartment I share with my husband and calico) I'm a complete nerd--at least as far as video games are concerned. Where my nerdiness really comes out, though, isn't in front of my TV (while playing Super Paper Mario, for instance)--it's in front of my computer screen, reading articles about the process of making games on sites like Gamasutra.com. 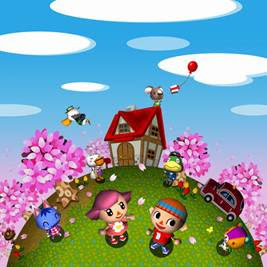 A perfect example of the kind of article I like to read (when I have the time) was posted recently on GameCareerGuide.com--an article by Eric-Jon Rössel Waugh titled, "Ambition and Compulsory Design in Animal Crossing." In the article, Rössel Waugh dissects Nintendo's Animal Crossing: Wild World--mainly from a designer's point of view, but partially from a player's point of view as well. It's quite an enjoyable read by a writer with whit to spare. Animal Crossing WW is a dangerously addictive game. And the small details in it makes it wonderful. I often find myself playing every day, I usually check up on my favorite neighbors to make sure they aren't moving. Occasionally I miss a day and someone I love leaves. It makes me sad.